Situated on the shore of the Ana Sagar Lake, Ajmer has fascinated people over the years with its rich historical, cultural and aesthetic appeal. Ruled by both, strong Hindu and Muslim rulers, Ajmer has over the years collected monuments and religious buildings that add to the city's historical value. 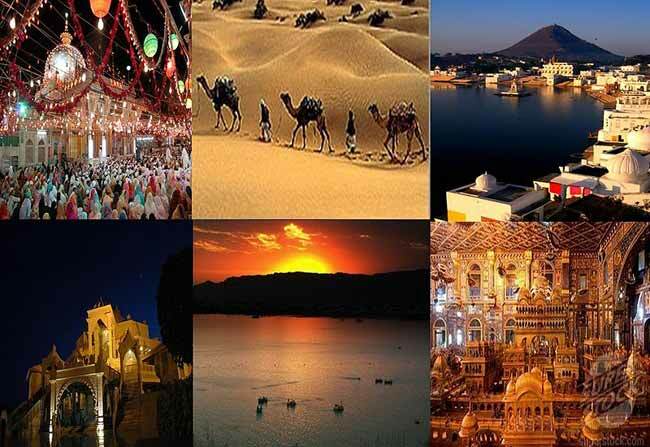 Places that must be visited in Ajmer are the Dargah Sharif, Adhai - Din - Ka - Johnpara, Ana Sagar, Foy Sagar, Akber Fort, Roopnagarh Fort and the Nasiyan Temple. The Adhai Din ka Johnpara has a fascinating story attached to it. Originally a Jain Temple that existed since 1153, the structure was destroyed to later convert it to a mosque by Qutubuddin Aibak. Built in just two and half days, the structure is called as Adhai din ka Johnpara. The structure still has traces of its predecessor, in form of beautiful Sanskrit inscriptions and ornate Hindu Architecture. The Akbar sFort manages to attract a fair share of tourist every year. Known as one of the strongest forts in the Rajasthan, the Akbar Fort however is relatively smaller than other forts in the region. Built during the 16th century by Akbar, the fort encompasses a beautiful palace that is well connected by a series of hidden passages and corridor. This marvellous structure is a must visit in Ajmer. The Dargah Sharif is probably the most famous Islamic pilgrimage places in India. Visited the people of all faith, the Dargah Sharif is one place where you can find people of all religions coming together to offer their obeisance. Dedicated to the revered saint Moin-ud-din-Chisti, the Dargah also is where the Sufi saint was put to rest. The Shrine consists of many beautiful structures, each offered by different Mughal emperors. The Dargah is located at the foot of the Taragarh hill, and the entire premises consist of the Akbar's Masjid, several marble buildings, the tomb of the Khwaja Moin-ud-din-Chistiand a massive gate that was commissioned by Shah Jahan. The Ana Sagar Lake was created in the 12th century by Anaji Chauhan, the grandfather of Prithviraj Chauhan. The lake spreads over an area of 13 kms and has ornate pavilions on the banks of the lake,. These were constructed by Shah Jahan in 1637. The Foy Lake is an artificial reservoir that was constructed in the late 19th century. This modern day hotel was once a dominating structure in the skyline of Ajmer is today a heritage hotel. Constructed by Maharaja Roop Singh of Kishangarh, the fort was constructed in 1648. The Roopnagar fort is filled with amusing rooms like the granary, armoury, medieval jails and other rooms. Known popularly as the Digambar Jain Temple, the Nasiyan temple was constructed in the early 19th century. Also known as the Lal Mandir, because of its colour, the temple has within it an array of wooden, gold and silver ornaments and decorations that one cannot miss seeing.